The citizens of Peru are taking a stand against the development of Tía María, an open pit copper mine in the Valle de Tambo in Islay, a province in the country’s southern Arequipa Region. The Mexican-owned mining company, Southern Copper, plans to invest over $1.4 billion USD in the project, which would make Tía María the second largest copper mine in the world. Peru’s Deputy Minister of Mines Romulo Mucho estimated that the mine would generate approximately $150 million USD in royalty revenue annually and produce $700 million USD in exports from the production of 120,000 metric tons of copper cathodes each year. The project received final approval by the state government in 2014, but since 2009 it has been continuously delayed due to ongoing resistance from the rural communities in the region. Local residents have been up in arms since mid-March, fearing that the mine will cause irreversible damage to their environment, water systems, and livelihoods. Peru’s struggle with Tía María and with resource extraction as a whole is highly contextual. It is deeply intertwined in the nation’s political and economic history, which has, in turn, shaped the various facets of Peruvian identity. In the past two decades, the Peruvian Andes have seen a dramatic increase in mineral extraction and exploitation owing in large part to groundwork that was laid by former President Alberto Fujimori during his rise to power in 1990. Fujimori’s presidency was highly controversial due to his conviction of widespread corruption, human rights violations, and adherence to the neoliberal agenda. Economic growth was achieved through economic policies including the privatization of state-run industries, which reintegrated Peru into the global economic system. As a result, Peru’s mining and energy extraction industry began to attract foreign investment from transnational mining corporations. The liberalization of Peru’s market economy and the implementation of attractive legal and tax regimes have transformed the country into a leading exporter of base and precious metals. Currently, Peru ranks third in the world as a producer of copper and zinc. Copper production is expected to double within the next year, and Peru’s expansive and untapped copper deposits are considered “golden opportunities” for international investors. While most would agree that the neoliberal reforms in the 1990’s were effective in bringing short-term macroeconomic stability, the long-term social and political consequences of these reforms have taken a significant toll on the nation. The population of Peru is largely indigenous, with 45 percent of its citizens identifying as Amerindian. These are the people whose livelihoods have been most affected by the surge in mining. Of course, the marginalization and abuse of the native populations in Peru can be traced back to Spanish quest for silver and mercury in the sixteenth century. Colonialism also led to the establishment of institutions designed to extract all excess income for the Spaniards, forcing the living standards of the native people down to a subsistence level. However, the exploitation of Peru’s native and rural populations is not confined to the past. While the government has made efforts to improve the quality of social services to rural areas, racial and social inequality persist due to its extractive policies and legal arrangements that place power in the hands of transnational corporations. The transnational mining industry, in particular, has a history of decimating local ecosystems and water resources while disrupting the livelihoods of the communities that reside there. Research shows that water quality and supply are major concerns for households that have experienced the development of mines in their region. For example, local residents in Cordillera Huayhuash say that rivers often become contaminated with mineral runoff or are subject to a reduction in water flow, causing a decline in wildlife activity and agricultural productivity. Peru’s long history of mining abuses has created a deeply rooted resentment towards the resource extraction industry within its native populations. This resentment continues in the form of relentless political activism and class mobilization. Ollanta Humala was elected to the presidency in 2011, running a campaign that supported opposition to the mining industry. Since taking office later that year, however, he has shifted to a position of support for Southern Copper in order to attract investments to Peru’s lucrative mining industry. A new EIS was presented by Southern Copper and approved by MEM in August 2014, despite imperfections, according to local opposition to the project. MEM announced that the license for the project would be given final approval in mid-March. Local residents of the rural Islay region mobilized a strike on Monday, March 23 to protest the approval of the mine. As the protests heated up, local residents began blocking highways and setting fire to barricades, resulting in violent skirmishes with the local police. A local farmer died of gunshot wounds from police on April 22, and another protester was killed on May 5. It was not until a local policeman was confirmed dead after a dispute with protesters on May 10 that the national government was prompted to take action. More than 1,000 Peruvian Army troops were deployed to the Islay province to maintain internal control and prevent further acts of violence in the region. The Army was also deployed to support the 4,000 local police in protecting local facilities, such as ports, roads, bridges, and tunnels. In hopes of easing the rapidly growing tension in the region, Southern Copper announced the suspension of the project for a 60-day period on May 15. The reaction did not turn out well for the company, however; on May 22 a fourth death took place, that of a protester who was killed during an attack on a local police station. The incident prompted the government to declare a state of emergency, including the suspension of constitutional rights such as freedom of transit and the right to hold meetings. Meanwhile the army has been dispatched to restore order in the region. How transnational corporations perceive and portray Peru is completely out of touch with the nation’s political and social reality. Ernst & Young Global Limited, one of the “Big Four” international audit firms, highlights this disturbing disconnect in its 2014/15 mining and metals investment guide—a “handbook” for companies wishing to exploit Peru’s mineral rich environment. The guide ironically begins by informing future investors that Peru “welcomes” foreign investment with an “open and stable” mining environment. It must be assumed that by “Peru” the guide is referring to the Humala Administration, and not the millions of its citizens who have been protesting the development of mining projects for decades. The investment handbook recognizes the local resistance to mining, rightfully warning future investors that the most important challenge the mining industry faces is gaining the social license to operate. However, the guide writes off local resistance as being “manipulated by politicians, anti-mining NGO’s, and other groups with wider political agendas,” then continues to explain the best strategies for successfully combating the issue. The handbook suggests that local communities be consulted from the outset to identify and eliminate potential issues and to inform the population of the economic and health benefits of mining in their region. However, the guide strategically chooses not to recognize that communities may continue to reject mining projects after negotiations. Southern Copper attempted many negotiations and public hearings to appease the citizens of Islay, but when local residents refused to back down, the corporation pushed the EIS approval process. In this regard, the handbook’s advice to consult local populations is nothing more than a tool for justification. Environmental concern is mentioned within the document but is not portrayed as a concern for transnational mining corporations. The undeniable environmental destruction in Peru is blamed on illegal gold mining. The illegal mining industry in Peru has become a major issue, since environmental regulation is even less of a concern for illegal miners than it is for transnational corporations. However, the potential for environmental damage is still a huge risk for legal and regulated mining practices. For example, Cerro de Pasco, a central Peruvian city located at the top of the Andes Mountains, has been devastated by a Peruvian-owned open pit mine engulfing the city. After 55 years of silver, zinc, and lead extraction, many would consider the city uninhabitable due to irreversible pollution from chemical waste. The rivers of Cerro de Pasco run red and mining dust looms over the city, killing off local animals and causing an array of health issues. The transnational mining industry perceives Peru, not as a nation that millions call home, but as a geographic space of mineral wealth that can be exploited for the global market. Ana Rodríguez and Roberto Villarroel, social activists from Peru and Bolivia, explained in an interview with COHA that Peru has fallen victim to the greed of the corporate elite, and the Humala Administration is no better, as it is failing to protect the needs of its people. They explained that during his campaign, Humala proudly said, “yes to water, yes to life, yes to the defense of the environment and agriculture, and no to mining, mining is death.” The citizens of Peru voted for Humala in hopes for a future free of environmental exploitation. Unfortunately, shortly after he took office, Humala allied with the transnational corporations and betrayed the people of Peru. When asked if there was a possibility of a successful negotiation between the government, Southern Copper, and the local population, Rodríguez answered, “It’s very simple; a synonym for mining is death.” Southern Copper and other corporations attempt to negotiate with the people by saying mining will bring them prosperity; however, Rodríguez claims that mining has only brought diseases and contamination to the environment. For Villarroel, the solution lies in the hands of the government. When the government makes the choice to favor the wellbeing of its own people in the place of the transnational corporate agenda, the people of Islay will be inclined to step down and negotiate for a more viable future for Peru. However, until that day, the battle is not yet over; for the millions of citizens who are struggling for their land and their livelihoods, it has only just begun. Andrew V. Pestano. “Peru deploys military amid violent anti-mining protests, deaths.” UPI News. March 10, 2015. www.upi.com/Top_News/World-News/2015/05/10/Peru-deploys-military-amid-violent-anti-mining-protests-deaths/9021431272286. Jeffrey Bury. “Livelihoods, Mining and Peasant Protests in the Peruvian Andes.” Journal of Latin American Geography, 1 (1), 2002. “Peru’s mining & metals investment guide 2014 / 2015.” EY. 2014. www.ey.com/Publication/vwLUAssets/EY-Peru-mining-metals-investment-guide-14-15/$FILE/EY-Peru-mining-and-metals-investment-guide-2014-2015.pdf. Diana Arbelaez-Ruiz, Juan Mauricio Benavidez, Bárbara Oñate Santibáñez, Rebekah Ramsay. “Institutional and Political Frameworks of Environmental Licensing Processes.” IM4DC Action Research Report. January 2015. Robert Kozak. “Southern Copper Temporarily Suspends Copper Project Amid Protests.” The Wall Street Journal. May 15, 2015. www.wsj.com/articles/major-peru-mine-sparks-nationwide-protests-1431726237. 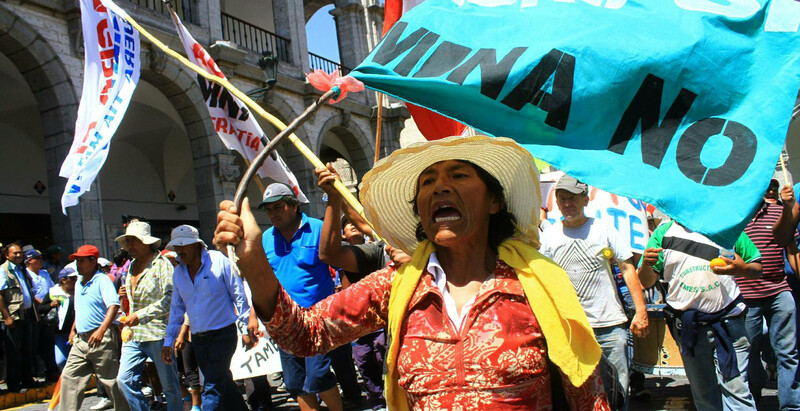 “Environmental protests lead to ‘scrapping’ of Tia Maria.” Peru Support Group. 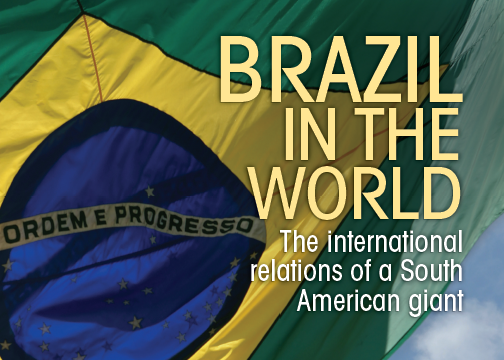 March 30, 2015. www.perusupportgroup.org.uk/article-828.html. 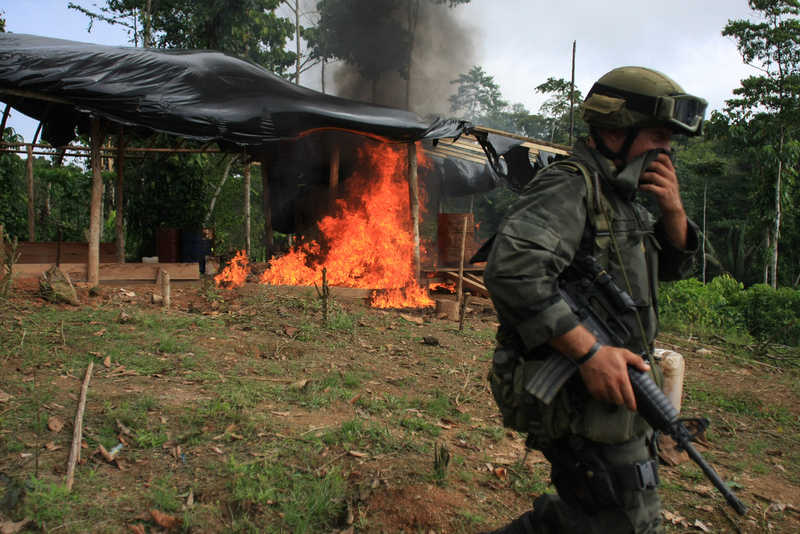 “Army deployed over Peru mining project violence.” The Tico Times. May 9, 2015. www.ticotimes.net/2015/05/09/army-deployed-over-peru-mining-project-violence. “What You Need to Know About Growing Opposition to Peru’s Tia Maria Mining Project (Part II).” Global Voices Online. June 2, 2015. www.globalvoicesonline.org/2015/06/02/what-you-need-to-know-about-growing-opposition-to-perus-tia-maria-mining-project-part-ii. Peru Declares State of Emergency after Mine Protest Bloodshed.” Telesurtv. May 22, 2015. www.telesurtv.net/english/news/Peru-Declares-State-of-Emergency-after-Mine-Protest-Bloodshed-20150523-0002.html. Ana Rodríguez and Roberto Villarroel, interview with COHA (translated from Spanish), May 2015.